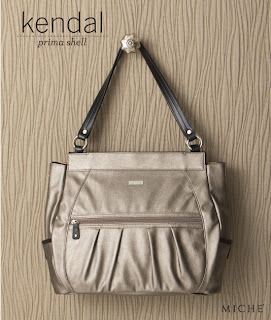 Like the light of the silvery moon, the Miche Bag Kendal Shell for Prima Bags glows with cool sophistication. So when you’re feeling a little bit glamorous, simply slip Kendal over your arm and you’re ready to WOW. Smooth, soft silver faux leather with top pleating detail, deep side pockets and logo plate; oversized exterior zippered pocket.